One of my favourite techniques for dealing with those troublesome foregrounds is the vignette method, which can be equally effective when used on watercolour sketches. This is especially true when you don’t want to include every bit of detail in front of you. The method can be carried out with a softening effect as though the viewing frame becomes more and more misty as it gets further away from the centre of the composition, or it can be accomplished by abruptly stopping detail while adding a few stray examples – perhaps stones, pebbles, grasses, plants or whatever is present, in the foreground. In this example of a cascade plunging between rocks I’ve simply splashed in a few hints of falling water with weak French ultramarine, and to the left-hand side have spattered some flecks of paint. The rocks have been faded out, although the method works equally well by rendering a few strong, hard-edged features at this point. If you find the latter method is too strident you can softly sponge away the hardness with a natural sponge and clean water until you achieve the effect you are seeking. It’s also a useful technique when you are out sketching and see those heavy rain-clouds approaching and need to finish it off at speed! Try it out – you have nothing to lose, as if you feel it doesn’t work you can always superimpose a more normal foreground over it. 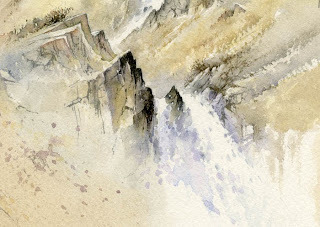 This entry was posted in David Bellamy, Vignette, Watercolor waterfalls painting, watercolour, wet in wet technique by David Bellamy. Bookmark the permalink.